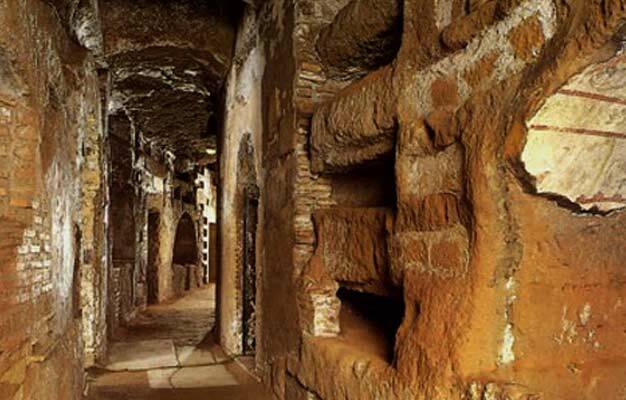 Go on a fascinating journey back in time through long winding catacombs and its crypts. You’ll never believe what lies beneath Rome until you see it for yourself! Go below to a time when Christianity was considered a cult, whose members were executed as heretics and buried as martyrs. These long corridors house hundreds of burial chambers, from modest singles to extravagant family tombs. The biggest surprise of this tour, however, and the one that will stay with you long after you have returned home, is the Capuchin Crypt. The recent addition of an official museum here means that our visit is preluded by an encounter with Caravaggio’s magnificent canvas ‘St. Francis in Meditation’ and relics from the life of St. Francis himself and some of his followers. But the real star of the tour is the crypt itself, decorated in the bones of 4,000 Capuchin monks. Witness a real skull and cross bones, chandeliers made of vertebrae and the chilling words ‘What you are now, we once were. What we are now, you will be’. According to the monks, this is a message of hope. The tour starts at Piazza Barberini by the large Triton fountain. Please be there 15 minutes before your tour starts. The tour ends back at Piazza Barberini. Yes, entrance into religious sites requires a strict dress code. Knees and shoulders must be covered for both men and women. CityWonders and Ticmate cannot be held responsible for refused entry due to improper dress. - Please note that Rome is one of the most visited cities in the world, making certain sites extremely busy in high season. Careful planning limits our exposure to crowds, but please be aware that some locations may be unavoidably busy during standard hours. The tour operates daily at 2:30 PM.